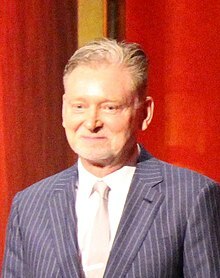 Warren W. Littlefield (born May 11, 1952) is an American television executive. Born in Montclair, New Jersey, Littlefield attended Montclair High School and graduated from Hobart and William Smith Colleges in Geneva, New York, where he was awarded a BA in Psychology. A protégé of Brandon Tartikoff, Littlefield developed Cheers, The Cosby Show, and The Golden Girls as senior and executive vice president of NBC Entertainment under Tartikoff. During his time as president of NBC, Littlefield oversaw the creation of many shows for the network throughout the 1990s such as Seinfeld, The Fresh Prince of Bel-Air, Wings, Blossom, Law & Order, Mad About You, Sisters, Frasier, Friends, ER, Homicide: Life on the Street, Caroline in the City, NewsRadio, 3rd Rock from the Sun, Suddenly Susan, Just Shoot Me!, Will & Grace and The West Wing. In 2012, he wrote a book, with T. R. Pearson, about his time at NBC entitled Top of the Rock: Inside the Rise and Fall of Must See TV. Since leaving NBC, Littlefield has executive produced TV series such as My Generation, Fargo, and The Handmaid's Tale. Littlefield was played by Bob Balaban in The Late Shift. Balaban had previously played Russell Dalrymple, a character based on Littlefield, during the fourth season of Seinfeld. Littlefield can be seen sitting at the bar during the series finale of Cheers. Littlefield had a brief cameo as himself in a 1997 episode of The Larry Sanders Show and again appeared as himself in the 1999 film Love Stinks. He also appeared in an episode of Blossom. In 2004, Littlefield appeared in an episode of A&E's Biography that looked back on the series Cheers. ^ "Warren Littlefield". imdb.com. Retrieved October 26, 2013. ^ "Warren Littlefield: Television Audiences Will Find Great Content, Wherever". youtube.com. Retrieved October 26, 2013. ^ "Top of the Rock: Inside the Rise and Fall of Must See TV Paperback". amazon.com. Retrieved October 26, 2013. ^ "Warren Littlefield's Books". goodreads.com. Retrieved October 26, 2013.